Saylor Jane loves to play in the koi pond. She does not care that it turns her coat lime green. Someone forgot to tell her that she is supposed to be a fru-fru dog. 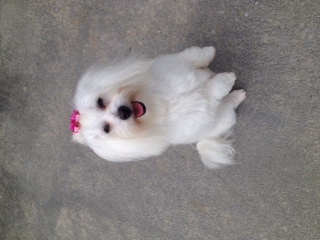 Or that she just got back from the groomers. She is so darn cute that I can't scold her. She is adorable. I like the way they trimmed her feet from knee down. 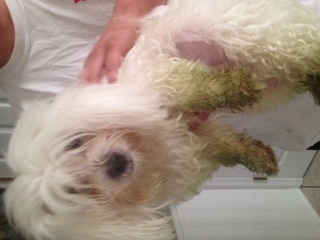 Our little coton loves to run around in mud and then I call him my little "stray" because he looks like such a mess afterwards!